Hardy succulents are a delight to those who consider themselves to have a black thumb. The word succulent literally means “juicy plant”. Most are hardy to USDA zone 5 (−20 °F /−28.9 °C to −15 °F/−26.1 °C) and some can survive in temperatures as low as -30 to -40 °F (−34.4 to −40 °C). They easily propagate and are low maintenance. They can be severely neglected and still thrive. 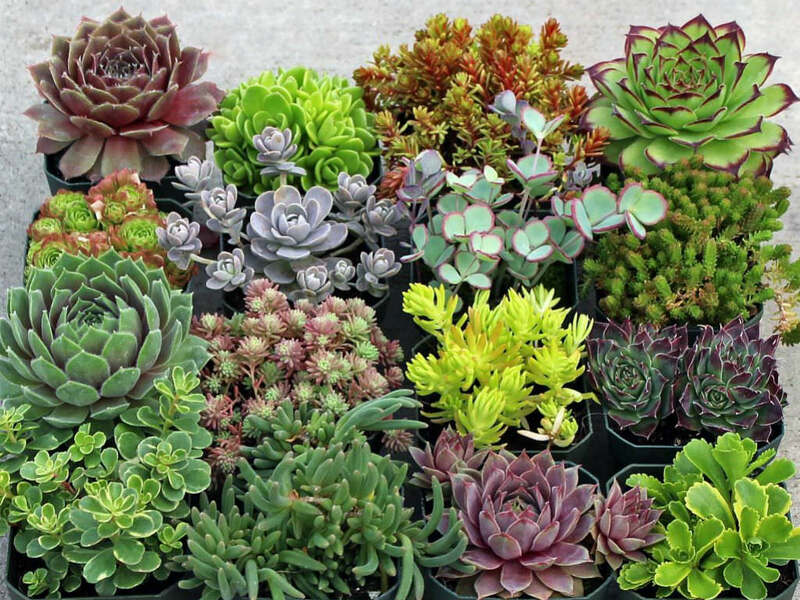 In fact, the only growing requirement that cannot be deviated from is that hardy succulents must be planted in well-drained soil to ensure adequate drainage. Do you live in an area where your soil has a lot of clay? No problem – just amend the soil with 50 % or more of pumice, perlite, coarse grit or sand and you’ll be ready to plant hardy succulents. To reveal the fullest most robust colors of hardy succulents, full sun planting is recommended. For optimal growth, a 5-10-10 fertilizer is recommended 1 to 2 times during spring. Bone meal (a mixture of ground animal bones, 4-12-0) can be applied to the soil anytime. Bone meal is basically a boost of Phosphorus which is promoting root and tissue growth. Common hardy succulents that are often found in local greenhouses include Sempervivum, Sedum, and Delosperma. Rarer species includes Jovibarba heuffelii, Rosularia and Orostachys. To find these plants you usually have to scour specialty greenhouses or rock garden suppliers. Sempervivum, also called Hens and Chicks, are very popular hardy succulents and this word translates to mean “Live Forever”. There are over 3,000 cultivars and they have many different textures and forms. Most Sempervivums produce tight clumps that form mounds and their colors are not only shades of green, but can also include silver-blues, purple, red, orange, brown and delicate pinks. Sempervivums propagate by producing at least four “baby chicks” per growing season. Chicks can be left attached to the mother plant or removed to start new a new plant elsewhere. Sedum, also called Stonecrop, has two primary shapes. It is shaped like low spreading ground cover or can be a two foot (60 cm) shrubby mound. They look great both in the landscape and in containers mixed with other plants. Colors range from smoky blue to rich burgundy. Provided it gets enough light, Sedum will produce flowers. Propagation occurs easily by removing and replanting the plant’s offsets, replanting cuttings, or by allowing the plant to self-seed. Delosperma is the favored “Ice Plant“. It is often used as ground cover and is ideal for planting in rock gardens. This attractive succulent has fleshy green foliage, low spreading stems and bright shimmering flowers that add color and texture to gardens. You can reduce reflected heat and glare by planting them in areas covered with gravel mulch. Jovibarba heuffelii is one of the lesser known hardy succulents, is also called Jupiter’s Beard. This succulent is commonly mistaken as Hens and Chicks. They offer a palate of rich colors that do not fade in the scorching sun. This unique succulent is multiplied by cutting the offsets (baby plants) which often grow between the leaves of the mother plant with a knife. If you choose to not multiply this plant, it will grow into a large beautiful mounding clump. Each plant produces five or more new rosettes each season. Propagation can also occur by seed however since these plants are hybrids, the new seedling will not be identical to the mother plant. Two more rare and interesting hardy succulents are Rosularia which resembles small Hen and Chicks growing in dense clusters and Orostachys, often called Dunce-Caps. Both look similar to Sempervivum, but are in fact closely related to Sedum. These two interesting plants take a little more effort to grow, but are worth it. If you choose to grow hardy succulents in containers more attention is needed for drainage. A typical succulent container mix is half compost and half drainage material such as perlite, coarse sand, coarse vermiculite or pumice. Adding bone meal or a low nitrogen slow release fertilizer such as 2-10-10 is also recommended when planting in containers.